Like many proto-scientific theories, the above definition does not make a lot of logical sense, but it still leaves one with a nagging feeling of truth. Maybe that’s because it manages to capture part of the genius of Quicksilver’s Boston Early Music Festival performance on Saturday night in Cambridge’s First Church—a genius based on dazzling technical mastery and sound ensemble practice, but transcending these logical ingredients to achieve a performance that was surpassingly communicative and soulful. There is a frequent misapprehension that the farther back one goes in the musical canon, the more austere and formalized the music becomes. Quicksilver put this one to rest with their lively and loving renditions of virtuosic German Baroque chamber works, proving that thrills, humor, and tenderness are some of the fusible ingredients that run through music of any era. 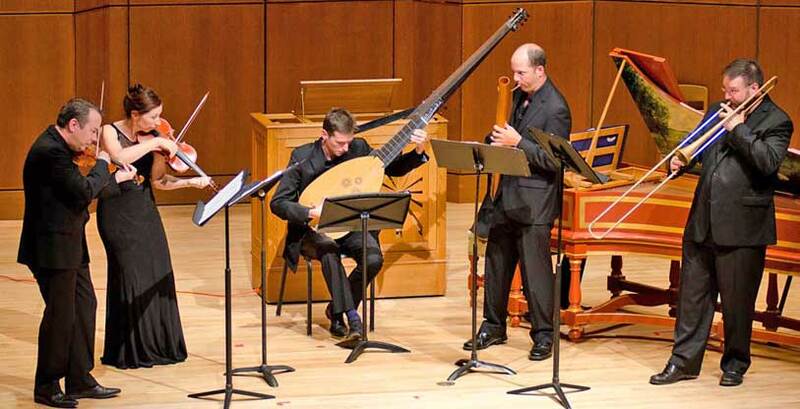 The program, titled “Fantasticus: The Extravagant and Virtuosic Chamber Music of 17th-century Germany,” comprised a fluid sequence of short sonatas, most including the full complement of musicians: Mealy and Andrijeski on violins, David Morris on viola da gamba, Dominic Teresi on dulcian (an ancestor of the bassoon), Charles Weaver on theorbo and guitar, and Avi Stein on organ and harpsichord. Sonata in this context does not imply the rigid formal framework of Mozart’s time, but rather, according to Mealy, “an abstract form of wordless conversation in music, whose only organizing principle was to delight and astonish the listener.” Indeed, the ease with which each work swayed between characters, rhythms, and flavors often gave the impression of a group improvisation, organic and direct in its expressive import. The program opened and closed with sonatas by Matthias Weckmann, a northern German composer beloved by Baroque cognoscenti for his creativity and style. One might have expected problems of balance, blend, and clarity from such a finely tuned ensemble in the cavernous (but packed) space of FirstChurch; however, every cadence, phrase, and rhythm emerged crisply, making me quickly forget any disparity between the intimacy of the group and their grand surroundings. Morris’s gamba was the only member that occasionally struggled to assert itself in prominent passages. Teresi’s dulcian was a surprisingly versatile presence. His round but slightly edgy color, strangely akin to a bari sax, was the first sound that reached my ears in the opening Weckmann; his gentle honking was also a pleasing feature of two sonatas by Antonio Bertali and of the penultimate piece on the program, a jaunty anonymous Ciaconna. Yet as a continuo or tutti player he blended seamlessly into the ensemble, and it was only when he rejoined the group after an absence—in the second Bertali selection, and in a highly imitative sonata by Massimiliano Neri which showed off the sonority of the ensemble’s blended timbres superbly—that I realized how much I’d missed the one-man wind section. Weaver on the plucked strings and Stein on the keyed ones were an able and flexible continuo section. Weaver navigated the towering forest of strings on his theorbo with a grace and keen attunement to his co-musicians that belied the instrument’s unwieldiness. His handling of the guitar had energy and rhythmic drive, appropriate for selections such as Johann Schmelzer’s show-stopping Polnische Sackpfeiffen, a gloriously campy work inspired by none other than the eponymous Polish bagpipers. Here the players made the most of Schmelzer’s wit, vivacity, and sly humor; contrasts between folksy and refined passages were satirically pronounced, the whole band channeling character changes with their bodies and facial expressions as well as instruments. Stein was a judicious continuo supporter, yet he emerged from the texture with assurance when called for, such as in extended duo sections with Mealy in the first half’s closer, a Buxtehude sonata. He also got his own moment in the spotlight, with a towering Præludium by Nicolaus Bruhns on the church’s own set of pipes, which alternated the requisite grandiosity with foot-tapping fugues. One of my favorite elements of the evening was the superlative interaction between violinists Mealy and Andrijeski. From the opening Weckmann, it was apparent they were in constant collusion, expertly imitating and supporting one another while at the same time maintaining their unique sounds. Bertali’s Sonata No. 10 had numerous highlights: the magically sudden dissipation of cadences together with gambist Morris, Andrijeski’s spicily intoned ornamentation, and the violinists’ mutual push and pull against the continuo. The surprise ending to the Schmelzer was another masterful moment, featuring an eerie plainchant-like melody and a final expiring glissando breath from Mealy. The second Bertali brought fleet, skittering bow work from all three bowed string players, as well as more piquant tuning in the chaconne section. Equally arresting was the communication among the entire group. The second half opened with a Canzon by Johannes Vierdanck, which showed off the ensemble’s unity to the max as they carefully controlled the pacing of each section, winding up and down with an almost supernatural internal pulse and finely calibrated dynamics. The closing Weckmann sonata showcased perhaps the most unsettlingly virtuosic ensemble work: a pastiche of themes jumping from player to player. I find that one of the pleasures of being a musician at a concert is allowing elements of the performers’ techniques to hit me in the gut, appreciating the execution and the effect simultaneously. What got me this evening was Mealy’s and Andrijeski’s consummate bow technique, whether darting in ornamental flourishes, retreating to a barely audible whisper, or landing with exquisite slowness on a final cadence. What got my companion, a guitarist, was Weaver’s rasgueado—the fleet finger strumming technique that equaled the violinists’ bows in detail and clarity. Yet holding the concert together was the group’s alchemical mastery of mood and temper, distilled and delivered from start to finish. Zoe Kemmerling, a recent graduate of the Boston Conservatory, is a freelance violist, baroque violinist, writer, and string instructor. She is also executive director of the new-music-oriented Equilibrium Concert Series. I imagine that the quoted passage is intended to be in the style of an alchemical treatise; the alchemists were big on mercury, attributing to it many sublime hermetic properties; and as the review says, the group’s mastery was alchemical. Quicksilver was appropriately mercurial, and exhibited many of the characteristics of that element; fluid, bright, always escaping the grasp but always retaining an essential purity and weight. Zoe Kemmerling captures well how virtuosity, scholarship, and careful preparation were combined to produce music that was constantly fascinating and full of ever-changing beauties. I particularly join in the appreciation of the many roles played by the dulcian; it is a wonderful thing when one can be reminded of Coleman Hawkins when listening to 17th-century music from Germany and feel that this is entirely right. I do have one bone to pick, however, with whatever devilish mind a half-millenium or so ago came with the name “dulcian.” This wonderful instrument has many virtues, including sonority, rhythmic versatility, expressive range, and a surprising capacity for lyricism, but sweetness and docility are not among them. Whoever chose to give this proto-saxobassoon a name that sounds like something elves might play in the Forest of Arden must have done so with malicious intent. Actually, the correct name for the Renaissance bassoon in English has been a subject of debate ever since the EM revival started…while the common 17th-c German name was “dulzian”, the contemporary English term was “curtal”. When Moeck (and others) started making modern reproductions of dulcians a few decades ago, they chose to anglicize dulzian to “dulcian” in the English version of their catalog, rather than calling the instrument a curtal–an apocryphal name, maybe, but one that has persisted to this day, mostly for aesthetic reasons. A lot of folks seem to feel the same way about “curtal” that you do about “dulcian”–it’s not very descriptive of the instrument, and it’s an ugly-sounding word, to boot. Their are fierce partisans in both camps, though–so much so that I once saw a 17th-century sonata for two bass instruments performed (according to the program) on “curtal and dulcian”–both instruments the same model, by the same maker!